There are many reasons a person is labeled a nerd. Here at The Fangirl Initiative we don't shy away from such terms: we embrace them. As fangirls, our love for our fandoms and interests can't be shaken by what society might deem as a bad label. Words like nerd can't hurt us. There is one reason far above the rest that I've found will make words like nerd or geek stick faster than a hot glue gun. This reason? Anime. I guarantee if you tell someone you fangirl over watch anime, you will be given judgmental stares and labeled "nerd" (unless of course said person is a anime fanatic like yourself). I've had this happen to me on a number of occasions, and while I've watched a lot of anime and read a lot of manga, I am no where close to some of the fangirls and fanboys out there (*sighs wistfully*). I'm here to give you reasons why you should ignore the stares, the comments, and even the labels. I'm here to tell you why you should be watching anime and I'll give you a few recommendations to get started. Anime is a specific style of Japanese animation*, both for film and television. Usually it's aimed at adults and children. Manga, however, is a specific style of Japanese graphic novels. They're two different things, though some of the titles and stories are the same. Anime = animation. Manga = books. Good? Good. *In Japanese, "anime" is simply considered to be animation from all over the world and "manga" is any kind of comic book/strip/graphic novel. For clarity's sake, anime here means the Japanese style of animation and manga means the Japanese style of graphic novels. Good, I'm glad you asked. Here's my five reasons (approved by a high anime nerd whom I love dearly) why anime is worth watching. There are plenty more reasons, but these five should satisfy. This is the obvious reason. The animation style of anime is far different than Western animation. It focuses a lot less on actual animation movement and more on art quality. This is why when watching, you might notice an interesting camera view or some other feature but it only shows up once due to budget. In addition, some of the backgrounds that appear in anime are actually based on real-life locations. The animation is done before the voice-acting, which differs from Western animation. Sometimes the animation itself is diverse between different styles. It's known for distinctive character features, such as the large eyes, but this isn't accurate for every single anime. Some do try for the realistic approach. Sometimes hair of characters is crazy either because of style or color. This technique--known as "hair action"--helps emphasize characters' actions and emotions. Artists also use a wide variety of iconic visual symbols and facial expressions to reveal emotions. Anime is also vibrant in color, which is eye-catching and aesthetically pleasing. And in some, there are many moments of exaggerations. These give unique style to the animation as well as come across as humorous. One thing I highlight when I recommend anime or manga is the unique story-telling anime has. There are stories all around us. Western culture is overflowing with stories through all types of media: books, film, youtube, TV, comicbooks, etc. The same is for Japan. The stories found in anime or manga are just as unique--or even more so--as in Western culture. I guarantee you won't find the same kind of stories in anime as you will watching an American TV show. But these stories have elements we don't always see in Western culture. There are historical anime movies or shows that reveal the Japanese perspective on world events. There are story lines that depict different worlds and cultures than the Western shows ever will. Anime provides a new avenue for stories, stories you won't find anywhere else. The biggest reason anime tells stories that can't be found anywhere else is because of the Japanese culture. Anime--no matter the genre or synopsis--is rich with Japanese culture. From popular phrases to rituals to even how their culture talks to one another, the influence can be clearly seen. Even anime that is set outside of Japan or with characters without distinct ethnicity, the themes of anime are significantly Japanese. While I can't guarantee you'll learn Japanese by watching (though you certainly might pick up on some things), I can guarantee you'll learn something about Japanese culture. So not only will watching anime introduce you to a new art style, give you fresh stories, but you might learn something about the other side of the world. You can be culturally aware. When I first was introduced to the Japanese style of story-telling, it was through manga. Reading and watching are two very different ways to enjoy a story. Book-to-movie (or TV) adaptations are definitely popular in Western culture, and it's the same in Japan. A lot of the anime are based off the manga (though on rare occasions the anime could come first). There are differences between an anime and manga of the same title and synopsis. But that's what makes both so great. I can read the manga and watch the anime to see it come to life. Or I can watch the anime, and when the season ends, I can fill my time waiting for the next season by reading the manga (because believe me, sometimes anime takes a long time to be released). The dual-experience of reading manga and watching anime is kind of cool. Manga has the opportunity to be more experimental than anime because it costs less to make. In addition, the manga can continue on when the anime has finished. Thus, you don't have to say goodbye to your favorite characters just yet. Remember when I said, we fangirls don't let words or labels keep us from loving what we love? Neither do anime lovers. I've been to a small anime convention and everybody has a blast. Whether you dress up as your favorite characters or you're new to the idea of anime, the fandoms welcome everyone with open arms. There's a special bond when two people realize they both love anime (this is how I've made many of my friends). In addition, the anime fandom knows how to have fun. They watch anime, they discuss it, they dress up, they have conventions. The market for anime-related items is skyrocketing. The growing popularity has caused more shows to be readily available in the US, both on TV and in theaters. The stories are catching the eye of bigger movie studios--and it's because of the fandom. There are a number of places to look to watch anime. Netflix has a wide selection or you could look at your local library for both anime and manga. Crunchyroll and Funimation are good websites to find a lot of anime legally. If you're in doubt about where to start, ask a friend who loves anime to help get you started. There are plenty of anime shows out there to satisfy any audience. A lot of anime can fit into more than one genre, which is definitely good. However, for time's sake, I'm only going to list the bigger genres and give a few recommendations for each. This list was compiled by myself and a handful of my friends who are definitely anime experts. Action/Adventure: This genre is pretty self-explanatory. It's full of action and adventure. Usually these anime have aspects of another genre such as fantasy or supernatural. Naruto: Ninjas. Naruto is an adolescent ninja searching for recognition and wants to someday be the ninja leader of his village. I've never watched Naruto, but I know plenty of people who have and love it. I'd find it surprising if you dive into the anime world and not hear about this one. Fullmetal Alchemist: Set in a fictional world styled after elements of the Industrial Revolution, two brothers search for a philosopher's stone in order to restore their bodies after they unsuccessfully used alchemy to bring their mother back from the dead. Ripe with action, humor, and fantasy elements, Fullmetal Alchemist was the first manga I read. It still remains a favorite, and the word on the street says if you're looking for consistency between the manga and anime, you need to watch the show Fullmetal Alchemist Brotherhood. Attack on Titan: Humanity lives behind walled cities because of the threat outside: Titans. Giant, humanoid, and hungry for humans, the titans threaten humanity's existence. But there are some brave humans who fight back and aim to discover where the Titans come from and why they are here. While I love Attack on Titan and eagerly await season two, I must warn you it's very violent and gory. The manga is rated 17+ for good reason, so if you're squeamish or easily scared, this might not be the best anime for you. Slice of Life: This genre focuses on realistic, day-to-day happenings. Sometimes the plot doesn't progress or the characters don't develop as much, but it's usually laced with humor and an emphasis on seasons or procedures. Like most typical aspects of anime, this can vary. It can also include other aspects of genres like comedy, drama, or romance (though it doesn't usually incorporate fantasy or supernatural elements). Lovely Complex (or Love Com): It's about a really tall girl and really short boy being paired, to their dismay, by everybody in their class because of their shared interests. However, as the story progresses, they start to realize how much they do care for each other. Funny, cute, and overall a great story line, Love Com is definitely a favorite and one of the first manga I read. Barakamon: An expert calligrapher, Seishu Handa, moves to a remote island to "perfect" his calligraphy. Instead, he has to deal with the residents of the island, which includes a little girl named Naru. This anime--and manga--is adorable and one of my top favorites. Psychological: Much like a psychological thriller, this genre of anime focuses on the mind and how it progresses in a character. In addition, it can present psychological and moral questions to the viewer. Death Note: Light Yagami discovers a book that grants the user the power to kill anyone whose name and face they know. All they have to do is write the name in the book. The epitome of psychological, Death Note is intriguing but very dark as it focuses on death and the morals of killing. Psycho-Pass: Set in a dystopian world, public sensors scan people's "psycho-pass" to determine whether someone will commit crimes. The story follows the members of the division that investigates the crimes. I've never personally watched it, but my friend recommended it as a good psychological anime. Think Criminal Minds with futuristic technology and dystopian government control? Mecha/Military: One of the oldest anime genre, it highlights on robots and machine technology as part of the plot. Usually--but again not always--it's paired with military themes. Code Geass: A former prince gains the ability called Geass and decides to use it to take down the ruling imperial monarchy and superpower that conquers many countries. I've read the manga but have yet to finish watching the anime. It's an enjoyable story with a mix of mecha, military, action, and supernatural elements. Toshokan Sensō (Library Wars): Set in a society where the government censors the media, a defense force aims to reduce censorship laws and find loopholes to allow citizens freedoms to the media. This story follows the first female defense force agent and her journey with the force. I absolutely love this story. It's one of my favorites and leaves me aching for more to read. It's highly military and action. Supernatural/Magic: Obviously, this genre includes elements of supernatural or magic. Sometimes, however, it includes a more vibrant, light-hearted tone than say the CW'S Supernatural TV show. Angel Beats: Taking place in the afterlife, the story follows Otonashi as he enrolls in afterlife school. He soon joins an organization to battle the student council president, who has supernatural abilities. I've never seen Angel Beats, but I've been told it's a good show, especially for those looking for supernatural elements. The Melancholy of Haruhi Suzumiya: Narrated by the male protagonist, Kyon, the story follows his misadventures with the intolerable Haruhi, who seeks supernatural phenomena such as time-travelers, aliens, and espers. This is one of my favorites as well (there's so many to choose from). Anyone looking for some ridiculous laughs, good old science-fiction and magic, and heart-ripping story lines: this is the anime for you. There are tons more genres--comedy, romance, history, fantasy--with most anime fitting into multiple categories. There are even anime films such as Spirited Away or Howl's Moving Castle, which are worth watching as well. It's definitely a worthwhile venture to try out. I have a friend who never dreamed of watching anime a year ago and now she is constantly discussing shows with me. 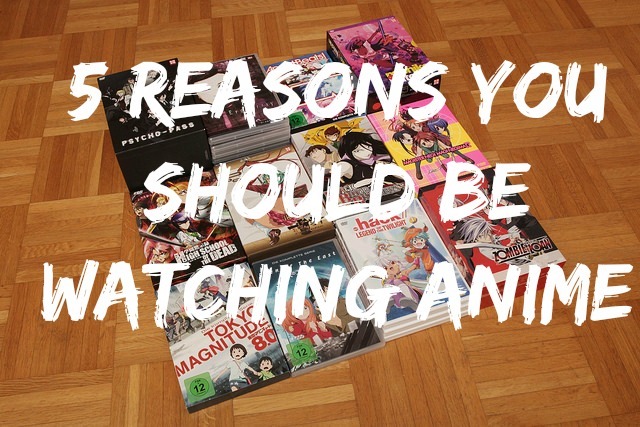 There's plenty more anime to watch (I'm constantly getting recommendations from people), and there's more to discover once you've entered the anime realm. So what are you waiting for? Do you watch anime? Or have thought about trying it out? What are some of your favorites to recommend?